KUTZTOWN, PA – When the sun finally broke through and National Dirt Week at the Kutztown Fair kicked off on Wednesday, August 15, Douglassville, PA’s Tim Buckwalter recorded his third win of the year in USAC All Pro SpeedSTR competition at Championship Energy Action Track USA. The victory also pulls Buckwalter back to within one of leader Billy Pauch Jr. in all-time SpeedSTR victories at the Kutztown Fairgrounds oval. 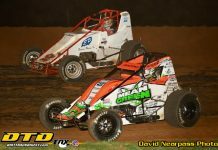 Wednesday was also the 60-lap Fair Week Nationals for the Hyper Racing 600 Sprints. When the checkered flag waved, the driver who won the very first 600 Sprint feature at Action Track USA in 2013 was standing in victory lane once again. 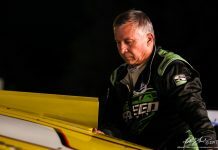 He started 29th in the 30-car field, and Brian Carber needed almost all of those 60 circuits to pick up his third career triumph at the Berks County speedway. The Junior Slingshots competed in a National Tour event on Wednesday, with Tanner VanDoren notching the big win over a talented 18-car field of Junior Slingers that even included a few Canadian visitors. Josh Dalrymple sped to the early lead in the 30-lap main for the USAC All Pro SpeedSTRs, with Kevin Graver Jr. in hot pursuit. Father and son, Tom and TJ Mayberry, battled for third right behind the front running duo while Tim Buckwalter looked for some racing room in fifth. Graver forged into the top spot on lap nine when Dalrymple got crossed up in turn two. The first stoppage occurred on lap ten when Earl Paules flipped on the homestretch in a crash that involved a couple of other cars as well. On the restart, Tom Mayberry shoved his No. 17r into the lead, dropping Graver into a side-by-side battle with T. Buckwalter for the runner-up slot. They turned their battle into a three-way tussle for the lead with Mayberry. As that trio fought for the top spot, point leader Billy Pauch Jr. was threading his way from 18th on the original start to sixth by the time lap 18 was scored. Ohio’s Matt Westfall made his presence known, too, rumbling into fourth, then passing Graver and Buckwalter to snare the runner-up position with 19 complete. As the laps counted down, Tim Buckwalter knew he had to make some moves if he was going to win, and he found a way to get it done. 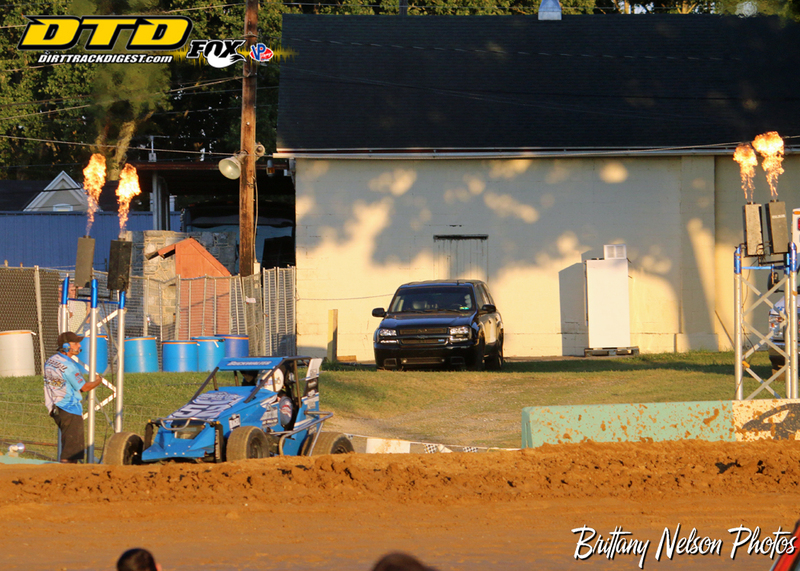 Buckwalter, the defending track champ in the SpeedSTR division, split Westfall and Mayberry in turns one and two, slicing through the middle and pulling to the inside of Mayberry as they blasted down the back chute. Buckwalter went deep into turn three, sliding up in front of Mayberry at the exit of turn four to claim the top spot with five tours remaining. Tim pulled away over the final revolutions, winning by almost one second over Westfall, with Tom Mayberry settling for third. Billy Pauch Jr. and Briggs Danner wound up fourth and fifth. 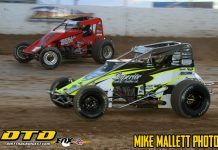 A few aborted starts plagued the Hyper Racing 600 Sprint main, as a 30-car starting field combined with a possible $2,000 winner’s payday produced some high-intensity, elbows-up aggressiveness among the four-wheeled thoroughbreds. When they got down to racing, Austin Quick lived up to his name by dashing to the early lead. Tenth-starting Kenny Miller III, in his first race since suffering a concussion in a flip at a USAC National Midget race, launched forward quickly, grabbing second away from Damon Paul on the fourth trip around the progressively banked oval. Paul danced with Alex Bright and Miller in a three-car tango for the runner-up position as Brian Carber and 17th-starter Kyle Spence weaved a path toward the front of the pack. A caution with 16 tours complete provided a timeout for the drivers, with Quick leading Miller, Carber (from 29th on the original start), Paul, Bright, and Spence making up the top six. The battles among those throttle-jockeys continued through the middle stages of the race, with Carber wrestling the runner-up spot from Miller on lap 24. A scary incident occurred with 35 circuits in the books when Joey Amantea flipped and cleared the wall in turn three. Amantea was not injured in the crash. With 17 to go, Bright reclaimed fourth from Paul as their race-long duel continued, but all eyes were now on the battle for the lead as Carber reigned in Quick and began his assault on his co-worker and roommate. Both drivers ran the bottom, but Carber’s mount was just a little bit better in the waning laps and Quick left him just a bit too much room in three and four with ten to go. Carber ducked under Quick, then shot by to grab the lead as lap 51 was scored. Once in front, Carber, from Pipersville and now living in Etters, PA, drove away to a convincing win, crossing the stripe with an advantage of 1.342-seconds over Quick as the checkered flag fell. Miller, Bright, and Paul rounded out the top five. The Junior Slingshots competed in a 20-lap, Junior National Tour event on Wednesday, with Stroudsburg’s Tanner VanDoren conquering the field. Van Doren led all the way to win handily over Aidan Donaldson and Bryan Preville from Quebec, Canada. Logan Bauman and Brian Smith finished fourth and fifth. National Dirt Week at the Kutztown Fair continues on Thursday, August 16, with the Super Slingshot Fair National for the All Star Slingshots. That race pays $2,000 to the winner (with Gambler’s Fee) and will run 55-laps. Joining the Slingers on the card will be, for the very first time at Action Track USA, the AMA Flat Track Motorcycles. Warm-ups begin at 6:15 p.m. with racing to follow immediately after the hot lap sessions. Saturday night, August 18, is the Mark Naftzinger Daniel Boone 153 for the Enduro Stock Cars. The season wraps up on Sunday, August 19, with Champions Night at Action Track USA. The 2018 point champs will be crowned after main events for the USAC SpeedSTRs, the Hyper Racing 600 Sprints, the All Star Slingshots, and the Junior Slingshots. Warm-ups commence at 5:15 on Sunday, with heat races immediately following the practice sessions. USAC All-Pro SpeedSTRs (30 Laps) — 1. Tim Buckwalter 2. Matt Westfall 3. Tom Mayberry 4. Billy Pauch Jr. 5. Briggs Danner 6. TJ Mayberry 7. Steve Nederostek 8. Jason Musser 9. Tim Iulg 10. Kevin Graver Jr. 11. Matt Janisch 12. Ed Kenderdine 13. Steve Drevicki 14. Alex Yankowski 15. Josh Dalrymple 16. Steve Buckwalter 17. Joe Vacarro 18. Pat Bealer 19. Earl Paules 20. Tyler Ross 21. Brad Brightbill 22. Dylan Hoch. Hyper Racing 600cc Sprint Cars (60 Laps) — 1. Brian Carber 2. Austin Quick 3. Kenny Miller 4. Alex Bright 5. Damon Paul 6. Kyle Spence 7. Andrew Layser 8. Robbie Hocker 9. Joe Kay 10. Mike Thompson 11. Jeff Hartman 12. Zak Fisher 13. Eric Ankiewicz 14. Joey Jarowicz 15. Joey Amantea 16. Tim Buckwalter 17. Colin White 18. Billy Pauch Jr. 19. Jason Swavely 20. Tyler Lindsay 21. Jimmy Glenn 22. Jay Hartman 23. Jacob Severn 24. Aaron Bolinger 25. Wayne Scott 26. Nash Ely 27. Danny Buccafusca 28. Jesse Maurer 29. Dan Schumaker 30. Richie Hartman. DNQ: Fred Heinly, Nate Schumaker, Eric Heydenreich, Matt Roselli, Brian Jones, Michael Fauci, Christian Bruno, Junior Ankiewicz, Tyler Kehs, Geordan Marrero, Ryan Stangle, Stephen Weirich, Lavar Scott, Ryan Conrad, Rich Maguire, Doug Snyder, Will Butler, Jared Lilly, Brett Altemose, Brandon Nicholas, Morgan Rochelle, Jacob Balliet, Brian Grogan, Shawn Rooney, Don Colaluce, Tom Scott, Dennis Chamberlain, Bobby Butler. Junior Slingshots (20 Laps) — 1. Tanner VanDoren 2. Aidan Donaldson 3. Bryan Preville 4. Logan Batman 5. Brian Smith 6. James Hendrick 7. Payton Nemeth 8. Jax Yohn 9. Morgan Laboda 10. Makayla Kohler 11. Shelby McLaughlin 12. Claude Liotte 13. Felix Roy 14. Wyatt Taschler 15. Casey Huffcut 16. Jacob Taylor 17. Tyler Ulsh 18. Aaron Diller. EG Mayor 600 Sprint Mad Scramble (10 Laps) – 1.Tyler Lindsay ($25 and transfers to A-Main), 2.Jason Swavely (Hoosier RR Tire), 3.Wayne Scott (Vahlco Wheel), 4.Matt Roselli (10gallons methanol from Road Runner Race Fuels/VP Fuel), 5.Brett Altemose (RTS Gift Certificate), 6.Tyler Kehs (Hyper Racing Gift Certificate), 7.Geordan Marrero (set of 4 FK Rod Ends), 8.Dennis Chamberlain (TSL Shocks Gift Certificate), 9.Nate Schumaker (Saldana Racing Products Gift Certificate), 10.Rich Maguire (Free Registration – Action Track USA), 11.Morgan Rochelle (Pyrotect Racing Cells Gift Certificate), 12.Jared Lilly 13.Brian Jones 14.Joey Jarowicz 15.Eric Heydenreich 16.Kenny Miller III 17.Ryan Conrad 18.Will Butler 19.Doug Snyder 20.Jacob Balliet 21.Bobby Butler 22.Shawn Rooney 23.Tom Scott 24.Jason Swavely.